If you’re already shopping at Macy’s, then you’re going to love earning Macy’s Money this week because the more you buy, the more you get! 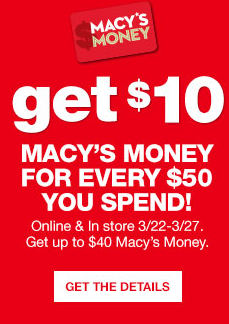 You’ll earn $10 for every $50 you spend online and in-store (up to $40). If you shop in-store, your Macy’s Money Rewards Cards will be given to you directly after your transaction at the register. If you shop online, look for a confirmation email with your Macy’s Money code once your order processes. Even if you shop online and receive your Macy’s Money code through email, you can still use it in stores; just print out the email and bring it with you! 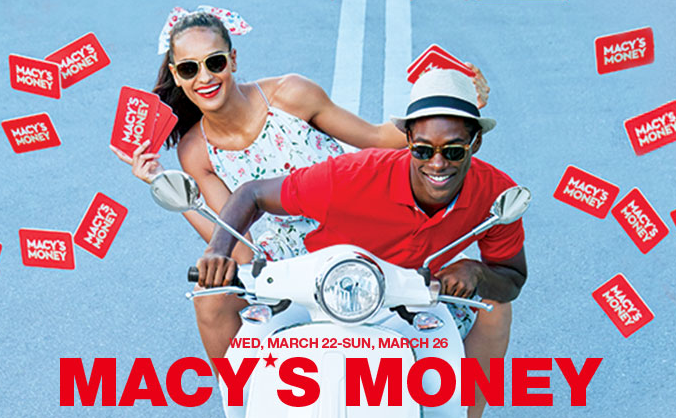 So to recap: spend online 3/22-3/27 and in stores 3/22-3/27 to earn Macy’s Money Rewards cards. Rewards may be redeemed online and in-store 3/28-4/2. Time to get shopping!